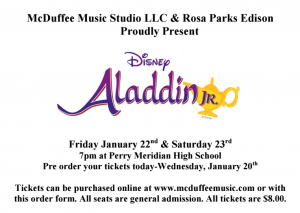 Get ready for a magic carpet ride as Aladdin Jr. glides into the Perry Meridian High School Auditorium January 22nd and 23rd. Duffee Music Studio and Rosa Parks Elementary present this captivating evening of music and laughs. Don’t miss it. Tickets are on sale now for $8 dollars.